Guillermo del Toro’s Pacific Rim is one of the those movies you go into knowing exactly what to expect, so it was a surprise when I enjoyed it more than I thought I would, more than any of the action blockbusters of the summer actually. It is a “big dumb” action movie, but a thoroughly entertaining one. Undoubtedly, the plot has more holes than Swiss cheese and the characters are rehashed from a grab bag of sci-fi action movie archetypes, e.g. the handsome (white) hero, the antagonistic egoist aka the douchey rival, the eccentric scientist(s), and the tough as nails military commander. 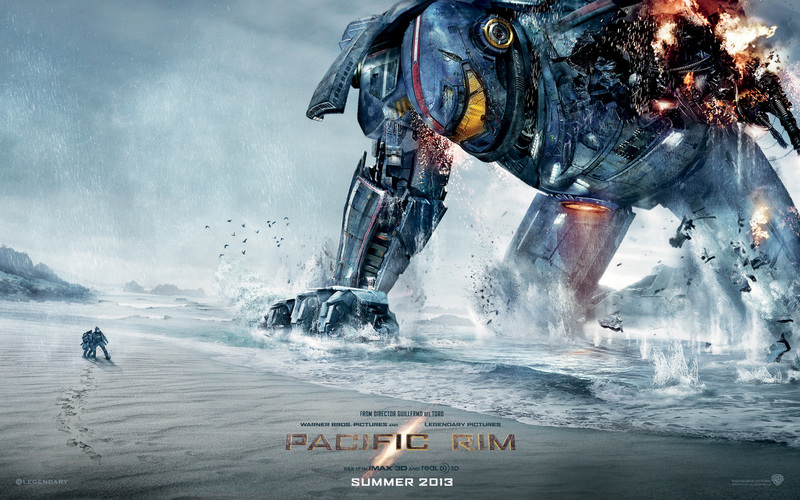 Yet for all these overly formulaic personalities and contradictions of its own logic, Pacific Rim manages to stay engaging, never serving up a moment of boredom thanks to somewhat endearing characters and more importantly skyscraper-sized robots smashing their fists into colossal monsters. The story goes that a transdimensional rift at the bottom of the ocean opens up and—naturally—releases what could only be described as the love children of Cthulhu and Godzilla: Gigantic reptilian-like monsters called kaijus. In response, humanity must join forces to create equally enormous two pilot robots dubbed Jaegers. With that, all the context needed to present the viewer with epic mecha action is established. From this premise you get all the usual narrative accompaniments: The drama, the love story, comedic relief, and of course the ultimate sacrifice. The characters can be shallow and are stereotypical of the action genre, but they do become charming at times. This is easily a likeable cast of characters, albeit one that invokes déjà vu. However, the film must have given me a “neural handshake” (part of a technological process in the film that bonds the mecha pilots together through memory sharing) because I was finishing characters’ sentences for them. That is no exaggeration the dialogue is that predictable, almost as foreseeable as the plot. Of course, no one is watching Pacific Rim for Tarantino storytelling and dialogue. We’re watching Pacific Rim for the grand spectacle of gargantuan robots fighting monsters and in this regard Del Toro delivers. The movie is carried forward by a handful of well-directed battles, usually held in cities for maximum visual destruction. These scenes are disorienting (in a good way), loud, and the sense of scale is effectively communicated. The melee based combat gives these fights a visceral sensation where the weight of each house-sized fist smashing against the ugly faces of the kaijus is virtually felt. There are also a few instances when Del Toro injects these sequences with some welcome and amusing directorial flourishes, essentially winking at the audience as they enjoy the ride. It is quite refreshing to see these types of action set pieces that differentiate themselves from the usual shoot outs, or humanoid versus humanoid action of summer blockbusters. Del Toro’s film isn’t trying to be anything more than what it is, a fun action adventure, and benefits from this honesty. The film never has a dull moment and is arguably more enjoyable than any of the action blockbusters released this summer. It will be interesting to see if Pacific Rim is successful enough that we’ll get more of these types of films and who knows maybe a live action version of the very adult Neon Genesis Evangelion. Del Toro’s greatest contribution with this movie will be introducing the rich mecha and kaiju genre to a broader western audience than isn’t just the American otaku. Literary critic, copywriter, and coffee drinker. Previous Post Games are Art. Now what?